New at SCALA: Menstrual Cups by Jimmyjane. These female intimate care essentials are unique in the SCALA assortment, offering consumers a custom solution that matches their active lifestyle. SCALA’s female wellness selection is continuously expanding due to the growing consumer demand for this product category. With ph-balanced lubricants, female shaving creams and more, taking care of intimate health is becoming a real selling-point in our industry. High-end brand Jimmyjane saw the potential and developed a new product to capitalize on the feminine care trend: premium silicone Menstrual Cups, which are now available at SCALA. 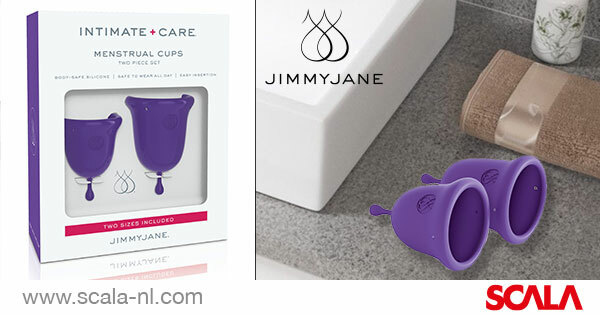 Jimmyjane describes the cups as: “Created with the intimate female body in mind, the bell-shaped curves hug contours, while the fuller, ergonomic rim was designed to prevent any type of leakage. Conveniently flexible for easy insertion. Removing your cup couldn’t be simpler with strategic anti-suction holes that allow for a gentle break of seal suction. Consciously convenient. Mindfully reusable. Efficiently eco-friendly.” The cups provide an alternative solution to female consumers’ period needs and give them a new choice in intimate hygiene.